The emblem is that of the First Troop Carrier Command. 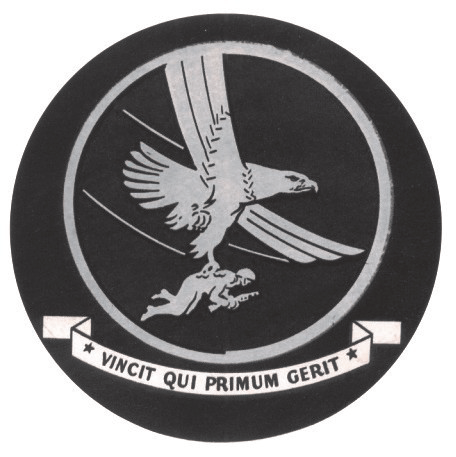 Its motto: VINCIT QUI PEIMUM GERIT means: “He conquers who gets there first”. An original patch is part of the Museum’s collection. It is hand painted on a leather disc. It was sewn onto a leather jacket worn by a crewmember. During World War II there was little debate as to what was desired of a transport aircraft: it was one that was equally useful for the delivery of either cargo or troops to their destination. However, the only aircraft specifically developed during the war for this purpose was the Fairchild/North American C-82 Packet that did not see service until after the war. Meantime, great resourcefulness was displayed in meeting emergency demands using the aircraft and equipment that was readily available. Those aircraft, forming the backbone of the Army Air Force’s (AAF) transport fleets, were the C-47, C-54 and the C-46. The Douglas C-47 Skytrain was a military cargo version of the DC-3, a standby of the commercial airlines for a number of years before Pearl Harbor. With other modifications the DC-3 became the C-53 Skytrooper, a troop and hospital transport. A steady and proven aircraft, the C-47 earned for itself a reputation hardly eclipsed even by the more glamorous of combat airplanes. The dependable workhorse of the air, one found it everywhere shuttling freight or airborne troops. Before the war was over the AAF had accepted more than 10,000 DC-3 type airplanes which was nearly half of the transport planes it received between 1940 and 1945. The Curtiss-Wright C-46 Commando was the military version of a yet unproved commercial transport. Like the C-47, it was a twin-engine monoplane but much larger and heavier with a maximum cargo capacity of 15,000 pounds against 10,000 for the C-47 and a passenger load capacity of 12,000 pounds against 6,500 for the C-47. Accordingly, the Army Air Force (AAF) rested high hopes on its development but engineering difficulties so persisted that it did not get extensive use before 1944. Total acceptance reached only 3,144 airplanes by August 1945. 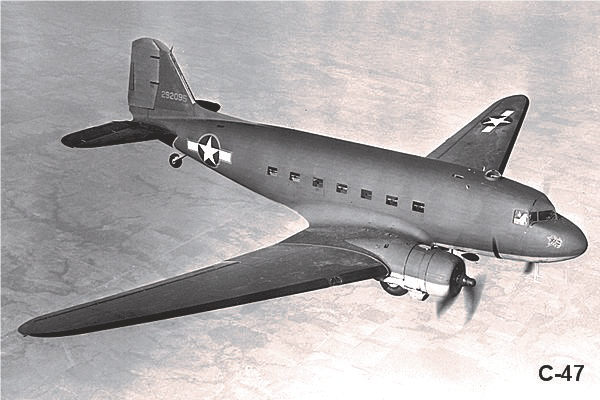 The Douglas C-54 Skymaster became the outstanding four-engine transport of the war. Known in its commercial model as the DC-4, the C-54 served chiefly on the long-distance hauls of the Air Transport Command. Strictly a transport and cargo plane, which was not modified for troop carrier purposes and would have been uneconomical in such a service, the C-54 was not available in large numbers until 1944. Its most colorful achievement came on the Hump route to China but it also cut down the great distances separating the United States from many other far-flung battle fronts as well. Among the bombers modified for transport service, the first choice fell on the Liberator B-24 because of its long range. Designated the C-87 Liberator Express, the modified bomber performed important transport services for the AAF from the beginning to the end of the war. As the C-109, it was used as a tanker and hauled large quantities of fuel across the Himalayas from India to China. Many unmodified B-24s saw unanticipated service as transports and tankers in theaters throughout the world; a notable example being the use of a wing of the Eighth Air Force’s B-24s in September 1944 to haul gasoline for George Patton’s Third Army in France. A variety of light utility aircraft carried the conventional symbol of the cargo airplane, though the cargo was rarely heavier than the baggage of some inspector or staff officer on a hurried mission. The need for such carriers during the early days of the AAF’s expansion was met by the purchase of a wide variety of light commercial airplanes, which soon presented peculiar and serious problems for the maintenance personnel. In time, four airplanes in this class were acquired in quantity: the Fairchild C-61 Forwarder, a single-engine four-passenger transport; the Cessna C-78 Bobcat, a twin-engine transport version of the AT-17 trainer which could carry five passengers with baggage; the C-64 Norseman, a single-engine plane designed as a “float and ski” freighter which was produced by Noorduyn Aviation Limited of Montreal and was used chiefly in the Arctic regions; and, the most satisfactorily of all, the Beechcraft twin-engine C-45 Expeditor. 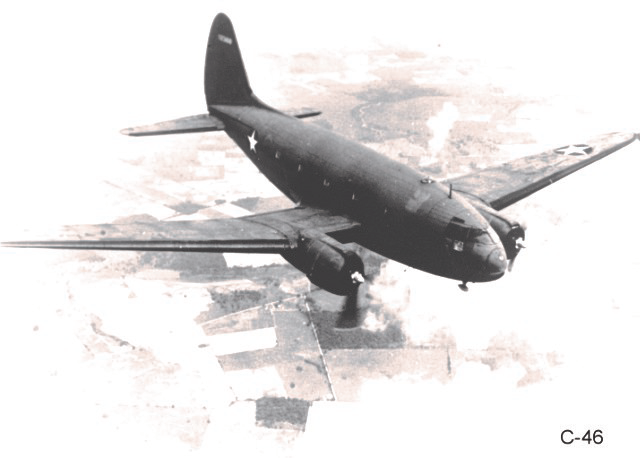 Its production was retarded because of the higher priority given to training airplanes; however, the AAF eventually accepted 1,771 C-45s by the end of the war. The importance of the transport plane to the operations of the AAF, whether as a carrier, troop transport or long-range cargo carrier, was illustrated by the growing number of these planes. In July 1939, the AAF had only 118 transports and on the eve of Pearl Harbor it had only 216. Thereafter, the inventory rose steadily and by August 1944 the AAF had more than 10,000 transports on hand. The glider was an important auxiliary of the troop carrier version of the transport airplane. The Army had paid little attention to this sports aircraft until the Germans demonstrated its utility for military operations. The Army Air Force’s Material Division began study of the engineering aspects of the glider in February 1941 and initiated procurement of the gliders for training purposes in April 1941. Two months later, a design competition for cargo and troop-carrying gliders was held from which the Waco fifteen-place CG-4A Hadrian, emerged as the most satisfactory. Its procurement was undertaken early in 1942 and the entire glider program was steadily expanded as airborne operations grew in size and importance. Although the CG-4A was frequently criticized after it appeared in the fall of 1942, it proved itself in airborne operations in Europe and Burma, where it was towed by C-47s and C-53s. None of the other gliders developed during the war could be seriously considered as a replacement for it. It was made of wood and had no motor or armament and carried only one radio for communications. 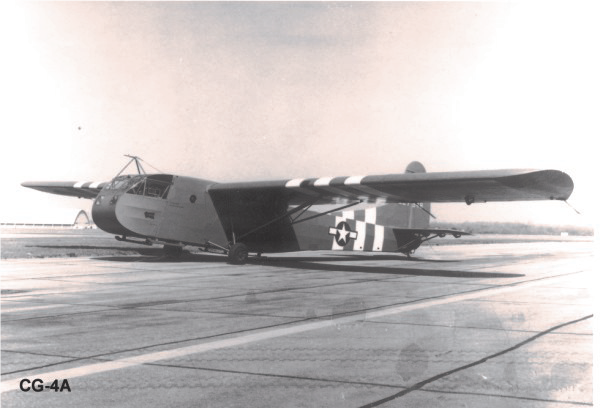 The CG-4A was the most widely used U.S. troop/cargo glider of World War II and eventually more than 12,000 were procured by the U.S. Army Air Forces. Fifteen companies, including piano and furniture manufacturers produced the CG-4A with 1,074 being built by the Waco Aircraft Company of Troy, Ohio. A C-54 Skymaster, C-47 Skytrain, C-45 Expeditor and the CG-4A can be seen at the AMC Museum. Back in 1964 I was coming back from leave ( Omaha ) from boot camp. My uncle wrangled me a seat on a DC-3 (that is what I knew it as – the Air Force designation may have been different) out of Offut for the flight back to San Diego. He was the navigator on the flight and a WW2 veteran. I was a lowly Naval E-2. I got called forward to have a few words with my uncle. The view was spectacular. Loved his control panel. And all the other passengers were envious. An E-2? Gone are the days. I’m doing some research on transportation. When was this article published? I had a big laugh when I found that military gliders were being made by piano manufacturers ””’ sounds a little incongruent. I spent four years at Dover. At first I was Air Policeman and walked the flight line under MATS aircraft. I was always part of the 95th Fighter Interceptor Squadron which was at Dover. I loved walking the flight line while my fellow mechanics were getting the F-106 repaired.